Operation Storax was the second fiscal year based "test series", running from 1 July 1962 and through 30 June 1963. This series was concluded before the signing of the Atmospheric Test Ban Treaty on 5 August 1963, and included the last U.S. atmospheric tests of any description (the last zero-yield plutonium dispersal test Roller Coaster Clean Slate III was fired 9 June 1963). Although the two limited test series Sunbeam (aka Dominic II) and Roller Coaster were conducted in Nevada and were simultaneous with Storax, it may be that these were not actually part of Operation Storax. I have included them on this page for convenience, although I list these test operations separately from the other Storax shots. The majority of the Storax tests were conducted underground, just as had been true during Nougat, although with better confinement of radiation than practiced at that earlier series. Storax included several Plowshare tests, including the spectacular (and thus very well known) Sedan shot. These tests were intended to develop nuclear explosives for non-military uses. 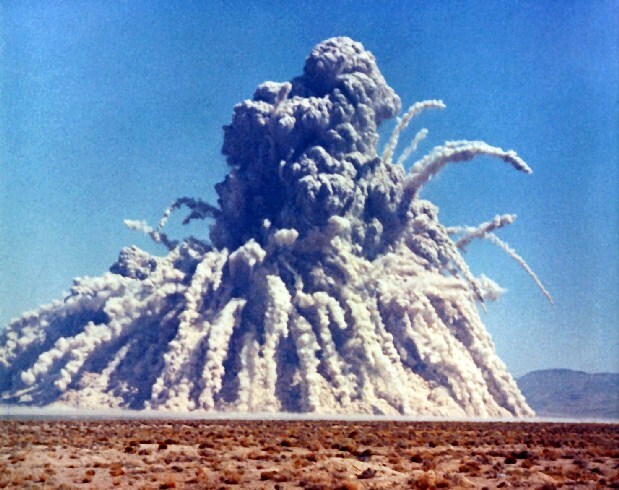 Sedan was one of the most spectacular nuclear test ever fired in the continental U.S. 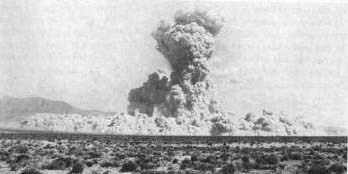 It was an LRL test conducted under the auspices of the Plowshare program, which was an attempt to develop non-military uses for nuclear explosives. 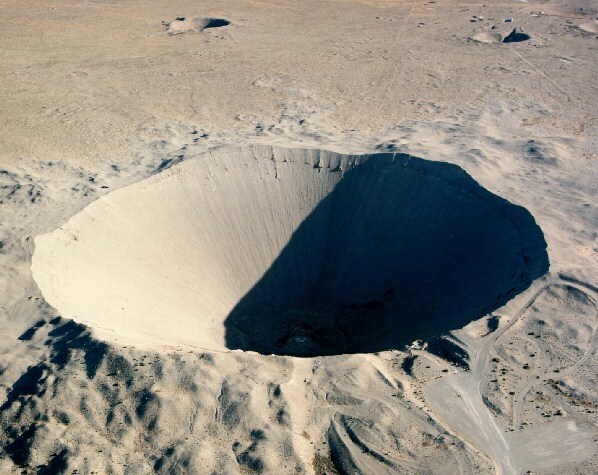 The purpose of Sedan was to investigate the potential of "clean" thermonuclear devices for producing large craters cheaply (for canal or harbor construction for example). Up to a point, the more deeply buried an explosive charge is, the larger the crater it will make. Beyond this point much of the material is thrown with insufficient force to clear the crater and falls back in, reducing the final size. At the optimal crater depth though quite a lot of material actually ends up back in the crater bottom. This is an advantage for a Plowshare-type crater experiment since much of the radioactivity gets returned to the crater and buried. The radiation release (as measured in terms of I-131, the most important from human health risks) was 880,000 curies, about equivalent to a 3-4 kt atmospheric fission test. Sedan was detonated at what was estimated to be the optimal crater depth in alluvial soil. 12 million tons of soil and rock were lifted into the air, 8 million tons of it falling outside the crater. 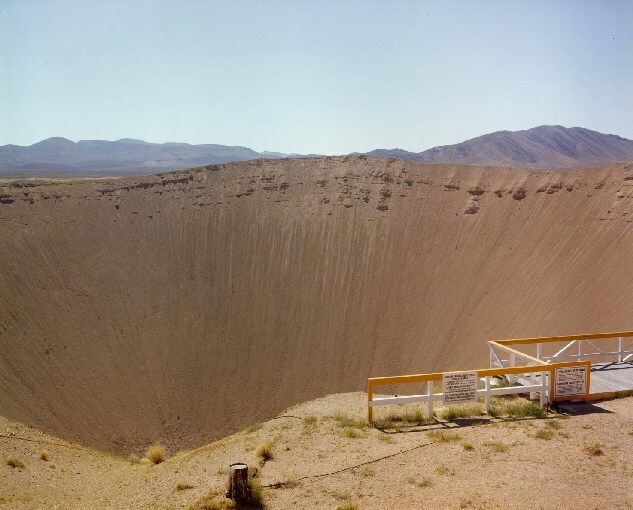 The final crater was 1280 feet wide and 320 feet deep. The force of the detonation released seismic energy equivalent to an earthquake magnitude of 4.75 on the Richter Scale. 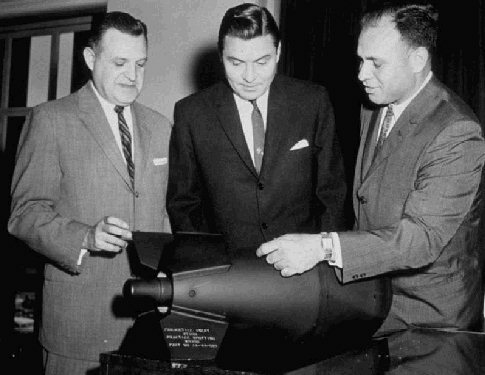 The device used was similar to that used in Dominic Bluestone and Swanee and was thus a variant of the W-56 high yield missile warhead. The device had a fusion yield of 70%. The Sedan device had a diameter of 17.1 inches, a length of 38 inches, and a weight of 467.9 lb. The crater as seen today from the viewing site on its edge (it is very impressive to visit). Sunbeam was a DOD sponsored operation planned to provide weapons effects data on low yield tactical explosions. An estimated 2900 DOD military and civilian personnel participated in Sunbeam either in Exercise Ivy Flats (held in conjunction with Little Feller I), or to provide technical or administrative support. Used a stockpile W-54 Davy Crockett warhead suspended above the ground. The plutonium warhead had a diameter of 10.9 inches, a length of 15.7 inches, and weighed 50 lb. 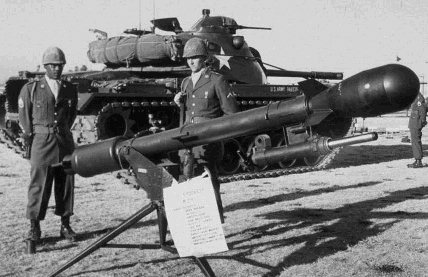 Below are pictures of the Davy Crockett, the first shows it mounted on a stand-alone recoilless rifle launcher. This was test of the W-30 TADM (tactical atomic demolition munition). The W-30 had a diameter of 22 inches, a length of 46.5 inches, and weighed 435 lb. The device was similar to that fired in Plumbbob Stokes. Test of missile silo hardening principles. Device similar to those fired in Nougat Ermine, Chinchilla I/II, and Armadillo. The device diameter was 15 inches, length was 15.5 inches, and the weight was 63.9 lb. Last atmospheric test at NTS, used a stockpile W-54 Davy Crockett warhead. 1000 DOD personnel took part in Exercise Ivy Flats which included an observer program and troop maneuvers. Five participants in the Ivy Flats maneuver task force launched the weapon from a recoilless rifle mounted on an armored personnel carrier. Robert F. Kennedy and General Maxwell D. Taylor were on hand to observe the detonation. Roller Coaster was a joint US (DOD)-UK test program to collect data on the safety of weapons due to accidental detonation. unlike most other weapon safety tests, this was not concerned with the question of one-point safety and the possibility of nuclear yields. The warheads used in these tests were known to be one-point safe. Instead the concern was the hazard presented by the dispersal of plutonium if the explosives were accidentally detonated (as happened in the 1966 hydrogen bomb accident at Palomares Spain). These tests are arguably the last U.S. atmospheric tests. Although they produced no nuclear reactions, and were not expected to, the U.S. government counts them in the official list of nuclear tests. See table summary below for list of Roller Coaster tests. Legend:WD=Weapons Development, WE=Weapons Effects, ST=Safety Test, TN= Thermonuclear, LASL=Los Alamos Scientific Laboratory, UCRL=University of California Radiation Laboratory (later Lawrence Livermore), DOD = Department of Defense.